The Allen curve is an observation made in the 1970s that the further away someone is the less likely a person will initiate communication. This evidence that backs the 'co-location wins' meme. 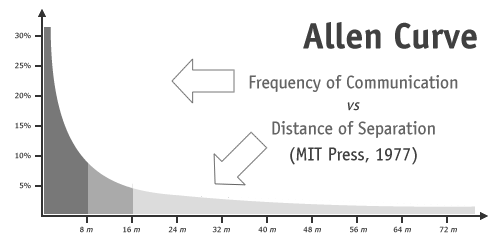 Tom Allen replicated the experiment in the early 2000's with the hypothesis that skype, email, digital comms and better av equipment would have reduced the impact of the phenomena. He found that the initial state - making a move to initiate communication remained the blocker to more frequent communication and collaboration. The current working and untested hypothesis is that younger people have spent more time online and collaborating digitally and so we have evolved our social practices to reach out more easily. It is my observation that this is true of some demographics but is not yet the normal state of people on teams. When you chose to work remotely you need to specifically address this issue. How can you encourage the flow of information and questions/answer activity that leads to collaboration?